As one of the Newborn Photographers Houston Texas, most every newborn photo session I’ve done has been indoors. Mostly because it’s either just too darn hot out, or it’s too cold or there are mosquitoes, or rain, etc. And since babies come year round, it is often just easier to have newborn pictures done indoors. However, recently I really was itching to do a newborn session outdoors…and in a more unconventional location. I was thrilled when this sweet momma said she was willing to have her baby boy’s newborn photography session outside. Upon arrival to our location, it was actually sprinkling outside and I was quite nervous if we would be able to do it. I can’t even begin to tell you how cool this family is and they were willing to just go for it, mist and all. Lucky for all, shortly after we began, the rain subsided and actually the weather ended up being so very pleasant out. Not too hot, not too cold, no rain and no bugs! YAY! I’m so pleased with these images and would love to do more outdoor newborn photos. So if you might want to have one, please be sure to mention it when contacting me! Now just scroll through and enjoy the sweetness! You likely saw part one from this session a few posts back, but here is part 2 because there was so much goodness to share! There truly is nothing that compares to bringing your newborn baby home and settling in to your new family arrangement. All the activity of the birth itself gives way to a peace of being home with a child you’ve been anxiously waiting to meet for the past nine to ten months. Now, it’s not all peaceful, of course. Although the majority of this newborn’s time (and hopefully a healthy amount of yours) will be spent sleeping, there’s also some crying, feeding, gassiness and pooping mixed in…but that’s just the normal stuff you’re probably expecting. If you have other children, especially if they’re still quite young themselves, the newborn experience becomes an entirely different situation. You’ll have all of the typical newborn things compounded with siblings who either want everything or nothing to do with the new baby and still have all their own complex needs. This new dynamic will probably make your life feel like a reality TV social experiment. Your day-to-day life will most likely vary between some of the sweetest moments you’ve ever known to some of the most frustrating and chaotic. But it’s beyond compare and you’ll love your beautiful mess! These pictures certainly show the beauty rather than any mess! Such a gorgeous family of five! There are few (if any) things in life that can compare to delivering a baby and bringing her (or him) home as a part of your family. As a mother, I have experienced that awesomeness, and, as a photographer, I get the pleasure of capturing these amazing moments for countless families. The following family is particularly special to me because I’ve had the privilege of photographing them from the time their oldest little boy was in his momma tummy! Since then, they have recently added an adorable and precious newborn girl. (Could she be any sweeter or more perfect?!?!) You might recognize them as they’ve been featured on here before and are just too cute for words. I love these sweet siblings and this whole beautiful family! I don’t think big brother could be any prouder or more excited about the arrival of this little doll! 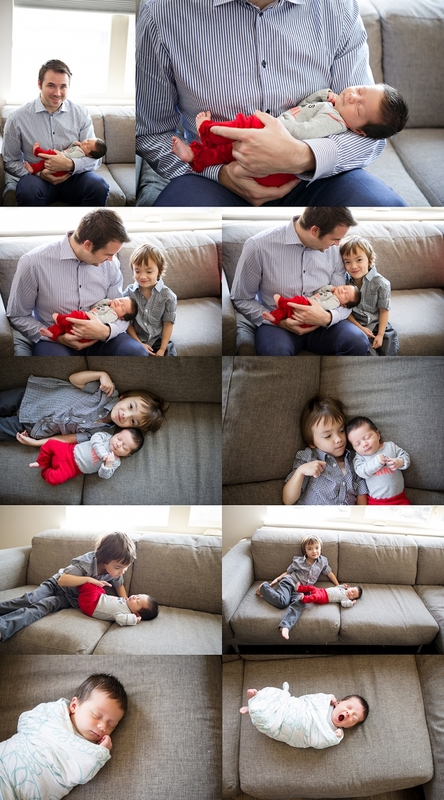 (Obviously their parents are too, but these kids are just so captivating!) There is such joy in seeing families grow! Part one of two…the second half of this session will be on the blog in the upcoming weeks, so stay tuned.